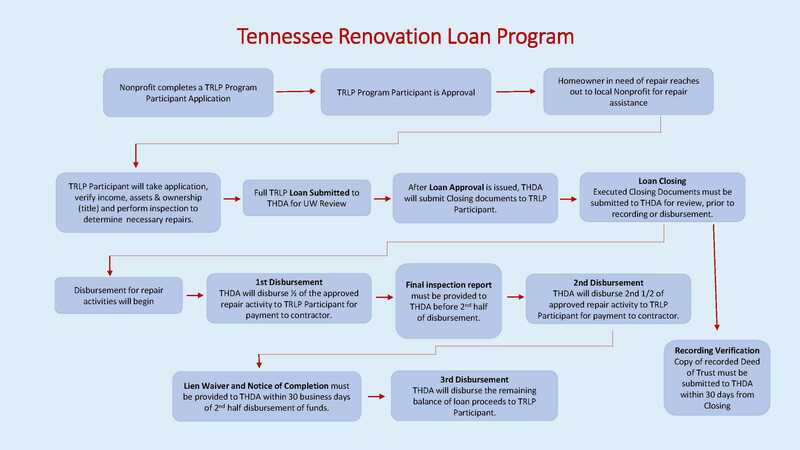 The Tennessee Repair Loan Program (TRLP) will help sustain homeownership across the state. The Program Goal is to help provide safe and sound housing to households of low income, veterans, seniors and homeowners with special needs through loans for repairs or improvements. How can I apply to become a TRLP Program Participant? You must be a non-profit organization organized under Tennessee laws with a 501(c)(3) designation and apply to become an approved participant of the program. To apply, you must complete a detailed Participant Application and submit it to THDA for review. THDA will review and respond to your request within 30 days of receipt. THDA will only review completed applications. Applicants are encouraged to use the Application Checklist provided with the Participant Application to avoid submitting incomplete applications. Once the Program Participant is approved, their agency’s name and contact information will be listed on the TRLP webpage.